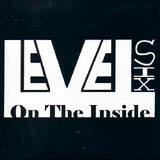 Level Six is new band based in Brooklyn, NY, with On The Inside being their demo release. The band is busy promoting themselves, while playing at various local (and national) venues across the US. The band's music can best be described as heavy rock / metal infused with dark tones and modern rock influences. The band's website describes their sound as "blending strong songwriting and melodic arrangements with a raw, super-charged sound." Super-charged is an overstatement, but On The Inside is still a nice building block form which they can acquire a recording contract, and continue to improve. The lead vocalist comes straight out of the modern rock school of singing. His delivery is melodic, and he stays in the low to mid ranges. Additionally, I would characterize his delivery as relatively subdued, much like the vocals you'll hear in Alter Bridge or Creed. During Views and Life Sentence, the band mixes in some harsh and aggressive vocals. This is a good idea in theory, but I don't care for the execution in this case. Instead of creating a nice contrast and variation in mood, they sound forced and completely out of place. Simply put, I think the vocalist was trying too hard to create an effect. If he were to bring it down a notch with the harsh delivery, I think this could turn into a good thing. Unlike most modern rock, Level Six' music features some nice riff work. It is hard edged and catchy, while the soloing and background shreds give the music some kick. The compositions have a nice melodic quality, which comes exactly as advertised from the band's website and promo package. Most of the demo can be characterized as subdued mid tempo to mid tempo rock/metal, certainly not super-charged though. I do think that upping the tempo would allow the talent of the guitarists to shine. During the moments when the music is moving along (Views is a good example), the guitar work is clearly at its best. Furthermore, I wish the lead vocalist could use a bit more energy and range on the high end. I also think this would add another dimension and flavor to the songs. I suppose that is the major drawback for me when it comes to modern rock style singing; the vocalist never lets loose with energy. After hearing the oddly placed harsh vocals in Views and Life Sentence, Love is a Myth tells me that the band may still be searching for a direction to pursue. This song has a distinct punk rock guitar influence, with equally punkish chorus line. The vocalist even adapts himself to nearly a Green Day like delivery. It's not a bad song for those of you who have an occasional punk rock craving, but I do find this track a strange departure from the rest of the album. At the end of it all, I do feel that Level Six is a band with potential. I am satisfied with musical talent of the band, and the songwriting skills seem to be in place. If they want to infuse some harsh vocals into their music, I think it could work very well so long as they don't try to hard to create a contrast. Like I said above, avoiding the punk rock direction would be a good decision in my opinion. Generally upping the tempo of the songs and the energy level (and occasionally the range) of the lead vocalist would be the keys for development here. From what I can tell, the guys seem very devoted to this band. Having said that, it will be interesting to see how the band builds off this solid building block.